This series of components are standard pneumatic treatment components, with complete specifications and wide applications. The filter features high water diversion efficiency and comes in 5um, 25um and 40um in terms of filtering accuracy. 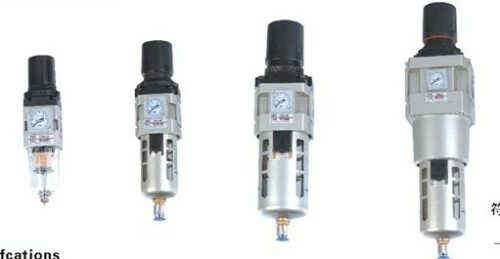 The pressure regulator allows large output flow and has good pressure regulating performance. Standard gauge and inbuilt gauge is exchangeable, larger bowl volume ,reinforced packing, Nice appearance. *Under the circumstance that the supply pressure is 0.7MPa(7.1kgf/cm²) and set pressure is 0.5MPa(5.1kgf/cm²) Rc. and NPT port size are available.